If you’ve been hanging out on here for a while, you’ll have noticed that I kind of love food. And, because I love food, I love cooking. That’s not true for all of us, of course. And that’s fine. But I think most would agree that having a few simple dishes under your belt is a bit of a life skill for all of us. From the perspectives of budget and health, it simply isn’t sustainable to live entirely off ready meals or takeaways (unless you have a supernatural metabolism or are fabulously wealthy). 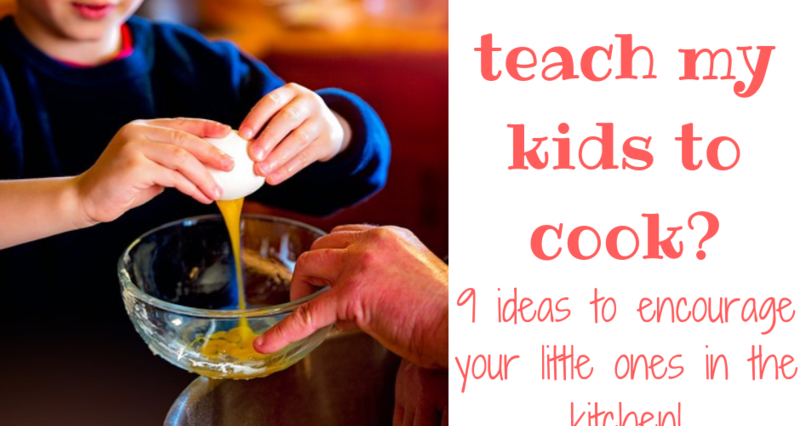 So, when we have kids, it’s natural to want to teach them a few basic kitchen skills. But how do we do this? When do we start? And what dishes should they start with? I’m happy to admit that I got it SO WRONG with Mister, now 9. Fortunately, I changed tack for Missy, Monkey and Meerkat, and I think this may be why the three of them love to be in the kitchen, whereas Mister isn’t so keen. Here are my top tips then, which come from several years of making mistakes, getting it wrong, trying new things and seeing what works! Honestly, there is no better age to start cooking than as soon as your kid can stand still for a few minutes! All kids are different, but for mine it was somewhere around the age of 2, give or take a few months. 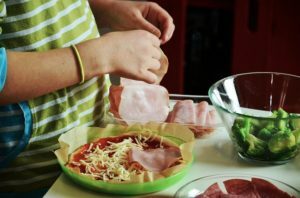 While I don’t recommend you teach knife skills at this age, there is plenty they can do: mixing and pouring are obvious ones, but how about finding ingredients or equipment if it’s stored in cupboards they can reach? Putting rubbish in the bin or recycling box? Don’t neglect these important but overlooked tasks! It makes clean-up so much easier if there’s not very much in the splash-vicinity! There’s less for your little one to damage, or be damaged by, and it’s much, much easier to stay focused if you just have your ingredients and equipment in front of you. While you may be experienced enough to work in a tiny area of kitchen not inhabited by dirty pots and pans (oh dear – is this just me? ), your child hasn’t yet learnt the skills or the coordination/spatial awareness to be quite so contained. Let them enjoy their cooking experience – give them a wide berth! This is where I got it wrong with Mister. I was so concerned about not making too much mess, making sure the mixture actually stayed in the bowl, and ending up with a decent amount of food prepared, that I was too controlling with him. No wonder he soon opted out of the kitchen! Honestly? There’s nothing in the kitchen that won’t wipe clean very easily – especially if you’ve followed step two and cleared a decent-sized space for cooking. And, in my experience, toddlers actually really like to be let loose with a dishcloth, so why not involve them in the tidy-up too? 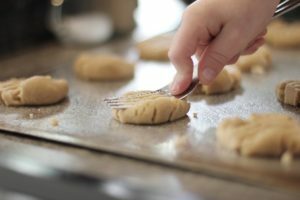 While we’re trying not to be too controlling, I think it’s sometimes easy to go too far in the opposite direction and let our kids make a mess without teaching them real skills. I’ll tell you a secret, and it won’t surprise you one bit. Kids pick things up really quickly when they’re taught how to do something. My boys are fantastic at cracking eggs – they mastered this skill when they were 3! We still do it in a separate bowl, just in case a small piece of shell needs fishing out, but I’ve taught them the technique, and every time we cook they get to practise again. If I just let them bang the egg really hard, crushing it in their fists, I’d have been depriving them of an important culinary skill. OK, maybe this is a really fun sensory experience once or twice, but the novelty wears off quickly, and kids like to be confident that they can do something well. Why not give them a new skill? Other skills we can teach kids: using an electric whisk, mixing, folding, manual whisking, measuring – and, when a little older, weighing and knife skills. Why assume these things would be intuitive? Children are more likely to enjoy something they know they can do well! As my kids have got older, they’ve been able to take on more of these tasks. For example, they know where to find ingredients and equipment which is stored at their level. They know where the recycling goes. At the end, they can help me load the dishwasher. Cooking can feel exciting and a bit glamorous to a young child – but tidying up really isn’t! And yet isn’t it important to teach our kids that there are some boring tasks that just have to be done? Before you start thinking our family resembles something out of Little House on the Prairie, believe you me, there are plenty of times when I shoo small people out of the kitchen in order to get dinner made. And yes, I do fob them off with YouTube or cbeebies or whatever will give me half an hour’s peace in the kitchen. Shoot me. In my defense, cooking is something I do to unwind and relax – it’s my ‘me-time’ in the day, my thinking and reviewing time. And also there’s just not always that much for the kids to get involved with. But I do think that cooking with kids shouldn’t just be about buns and fairy cakes. 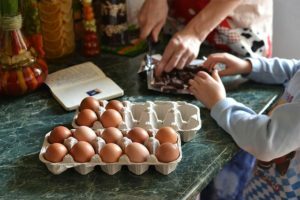 Not only is it slightly imbalanced for your child to grow up thinking that we all eat that much cake (“But we do, we do!” cried every parent ever), but also because they won’t learn about other ingredients, or skills which aren’t used in cake-making. But others are a total waste of money, as the dishes taste awful, and the methods are no simpler than those in your ‘adult’ cookbooks – where I bet you’ll find loads of recipes that are perfectly suitable for your kids to make. For example, Every.Single.Kids.Cookbook will give you a recipe for fairy cakes. But I find them really time consuming. There’s the cake bit, then you’ve got to let it cool, while you shower your kitchen with icing sugar trying to make some overly-sweet topping, then you need to spread it on each cake, and possibly add sweets, depending on whereabouts in the whole scenario you lost the will to live. Me? I’d rather make (and eat) a brownie. They’re so easy. Mix up the ingredients, whack them in the oven, spend 25 minutes licking the bowl, then BAM, you’re done. Simples. Although I’d recommend the cookbooks mentioned above, I really don’t think it’s necessary to invest in specifically kid-oriented cookbooks in order to enjoy cooking with your kids. They’re much more likely to be inspired by something they know they’ll enjoy eating too! Now here’s the cool bit. Remember my 9 year old who’d lost interest in cooking? Well, we’re (albeit slowly) getting him back into it. The biggest motivating factor for him? Cooking for others. While small children love to show off a cake they’ve made to guests who are about to devour it, older children can take more of a hand in family meals, and feel the satisfaction of their efforts being enjoyed by others. For Mister, this began when we found a ‘Boys’ Cookbook’ in a charity shop. He went through a phase of choosing a meal from the book, and cooking it for our Saturday night dinner with the help of me or DesertDad. Sound a bit extreme? Yeah, I thought so too. Except when I stumbled upon ‘Cooking Camp for Kids’, an inexpensive digital download course which you do in the comfort (and timeframe) of your own home, my ears pricked up. The course is designed for older children and young teenagers to master the skills needed to create six different dishes. The idea is that each dish is made several times, with more responsibility taken by the young person each time. By the end, they’re cooking each dish from scratch by themselves. Sure enough, the challenge element of it appealed to my son. The first dish – chicken wraps – he’s now made three times. The cool thing is that each time he’s suggested new variations and ingredients to add (as suggested and encouraged by course author Rebekah Sayler). We’ve yet to try the second dish (we’re taking our time and I don’t want to push him), but I think we were all impressed by the quality of the first, and the variety suggested by the remaining five. AND the course is an absolute snitch at $8 (a little over £6)! Affiliate disclaimer: This post contains affiliate links of products I really, really like and recommend. At no extra cost to you, I make a small commission if you click my link and make a purchase. Thanks for your support. How do I connect with my 8 year old son?